Did you know that remodeling a house is more art than science? I was talking with Eric our foreman today. I asked him why is it that we purchased the same exact brand of paint, in the same paint number, yet it doesn't match our old paint color EXACTLY? He said it never does. I thought the paint was mixed by a computer now? Still the color doesn't match exactly. I can't understand it! Our orange wall isn't the SAME exact shade of orange as before, even though it's the same exact paint color. Why is this not possible? It totally baffles me. I guess even the dye lots are different? Then Ben the templating guy came to template the countertops for the quartz counters we're getting. He had trouble with the templates for the new bathroom sinks. Guess what? Every sink isn't EXACTLY the same! I asked Eric again, how is this possible? He said it happens all the time. This is news to me. I can't believe this kind of stuff isn't a more precise science. The art of the curved countertop. Todd had drawn out the curved countertop shape on graph paper in the dimensions that he wanted. So Eric and Billy measured it out and used some ingenious MacGyver-esque method with screws and a long piece of wood and created the curve. Then Billy cut it into shape for the templating. Todd is super-excited about his curved peninsula countertop that he designed himself. I'm super-impressed with it! He didn't even use Photoshop! :p Billy worked very hard today. 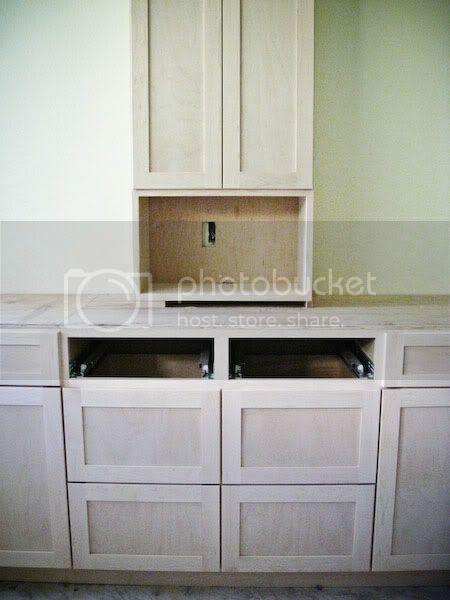 He finished installing all the cabinets, and put crown molding and toe kicks in. It really looks fantastic! AND he fixed the master bath cabinet so now it lines up perfectly. Cabinet staining starts tomorrow and lasts for a few days. 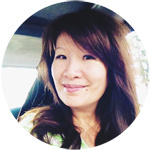 All of a sudden things are picking up speed after a lull! Oh .. yes it is sometimes really difficult ... But you can recognize it's priority! Love the curved counter top. I love that things are not exactly the same - no matter how hard scientists and engineers try, everything is a little unique - a bit like us! Looking forward to the continued progress of the kitchen. Here things went so quickly at the start, and now have really slowed down. I can't wait for it to be finished now.....race you to the finish!!! 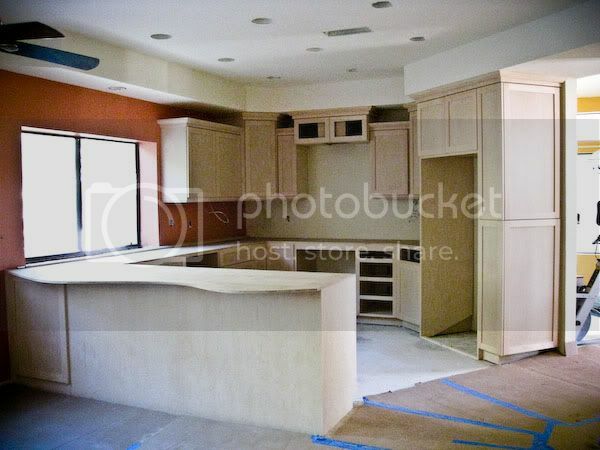 wow - it all turned out great - wonderful curved countertop - Congrats to Todd! I love, love, love that curved countertop! We're thinking of re-doing our kitchen island. I'm going to pass this on to the hubba for an idea! I can't wait to see more pictures of the project! Anyway it is looking great. 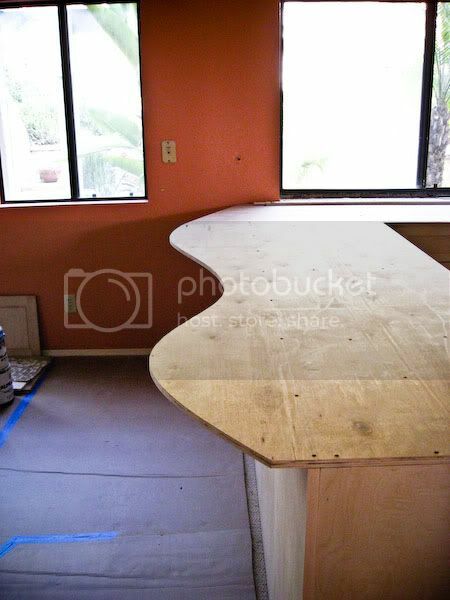 The curved countertop will be beauitful with the quartz on top! Wow! Your kitchen is looking amazing! I totally love the curved pininsula. I just discovered your templates...how I missed them on my last visit I don't know. So as I was going through them, I was amazed to see your Sunshine layout. Why? Because I have it saved in a folder on my computer of layouts that inspire me and I didn't realise you were the creator of it. So I thank you for sharing the template! Lovin' that curved countertop! So, who's more creative?? You or Todd??? I am having so much fun following the remodel project...I cannot wait to see the cabinets stained! Thank you for your sweet comments about my baby's birthday...you have no idea how much that means to me!